I know writing about this will get mixed reactions. 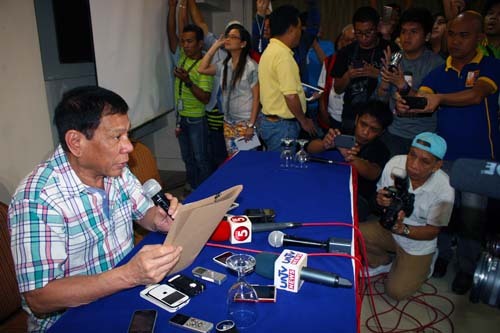 I understand that a lot of people have put their hope that Duterte would run for president but with his declaration today, social media screamed red as people expressed their disappointment over his decision. While I am impressed with Duterte’s discipline and good governance, I have to admit that there’s so much more I need to research on. As a voter and responsible citizen, I know that I must do my homework and get to know the candidates I wish to support—it’s not criticizing them, it’s more of assessing their track record, looking at what they’ve done so far in the community, how they’ve handled their positions in government, their leadership skills and the plans they have. If Duterte decides not to run for President, let’s respect his decision, sad as it may be. While I know that there are a lot who have pledged to support him, we must not forget that at the end of the day he is very much human like us. He knows what he is good at, he knows where he can perform well at the moment and I think he knows himself well enough to determine whether now is the right time to run for higher office or not. Think about a woman who is not ready to marry and become a mother. Yes, there are supportive family members and relatives who may pressure her into doing so but if the woman knows she is still not ready, forcing her into marriage and family life can have a profound life-long effect emotionally, mentally and spiritually. If you pressure someone to do something he is not ready for, two things can happen—either he gets so nervous about screwing up and he ends up making more mistakes or he gives in to crowd pressure and ends up disappointing them because he couldn’t manage what is expected of him. I think for us voters, we have to be reminded that the leaders we put into position are so much like us—flawed and imperfect. We each have our quirks, we have areas we’re good at and there are things we need to improve on. I know that marami ang natutuwa sa style niya ng law enforcement and punishment. Still, we have to remember that no matter how good of a disciplinarian a leader is, if the crowd is stubborn and chooses not to follow, ano na ang mangyayari? We also have to remind ourselves na sumunod tayo sa batas, na sa mga simpleng bagay, maging disiplinado tayo. No loading and unloading zone, nagbababaan pa din. Walang tawiran nakamamatay, may tumatawid pa din. Bawal mag-tapon ng basura dito, may makikita kang nagtatapon pa din. I am not a government official nor am I an expert when it comes to politics (the Senadora story is just a parody I began in 2008) but as a Filipino, I have observed how a disciplined population can contribute to better governance. Just think about how we Filipinos behave and follow rules when we are in foreign countries like Singapore or the US. Why can we follow rules in other countries but not be disciplined enough in our own country? Who gave us the right to “punish” them? Yes, they may be imperfect but that doesn’t mean that we have the license to disobey just because they disobey or they’re not good at what they do. I find myself convicted by this very statement I wrote–how many times have I tried to justify my disobedience by pointing the finger at someone, when in reality disobeying him will not address the situation–it will only get me in trouble? Let’s give Mayor Duterte a break. We can thank him for the good example he’s set, for the way he has excellently governed Davao City but let’s not hate him for refusing to run for the presidency. If there’s anything I appreciate about him, the man knows his limitations; he knows when he’s had enough and stays focused on the present responsibility given to him. I just wish that those who will be running for positions in the government would take lessons from him–why do people appreciate his style of discipline? Why does he have charisma even if he’s not dressed to the nines and beaming a Colgate smile? Why do the Davaoenos submit to his authority? As for us citizens, let us change the attitude of being “pa-astig”–not following rules just because we feel that we have the right to disobey. Let’s be more disciplined as a nation for discipline is not just for a few people. If we want change, change should begin with us. Let us not be overly-dependent on leaders to fix us or the problems of society; we have to cooperate. The leaders are not magicians or genies, they don’t have Wikipedia brains, they do not have the answers to everything. Aside from cooperating, another thing we can do as a nation is to consistently pray for our leaders and those who will be winning the 2016 elections. Pray for God to guide them, to convict them of sin in case they get tempted to steal or abuse their power, pray that they would not think of what the position can do for them but what they can do with the position to better serve the Filipino people and improve the Philippines. Thank you Mayor Duterte for your honesty and service.